A lovely and an easy side dish with Potatoes and peas, in a mild blend of spices, that goes very well with chapathi's. Pressure cook the potatoes , peel the skin and dice them. Chop the onions, tomato and green chillies. Heat oil in a pan, add the seasoning ingredients saute them for a min. Add chopped green chillies and onions , saute till the onions turn soft. Add the ginger-garlic paste saute for a min. Add the chopped tomatoes ,turmeric powder, coriander powder, chilli powder, garam masala and saute them well, until the tomatoes gets cooked well and oil gets seperated from the mixture. Add the peas with a cup of water and cook them till the water has lessened Cover and cook for 5 mins in medium flame. Garnish them with fresh coriander leaves. An all time favourite, a must in the restaurant menu. Ur version sounds tasty and the click is tempting. Yumm! !my all time favourite side dish, just love with rasam..
yummy side dish, my fav. one. Oh Aruna, The Aloo Mutter is mouthwatering...nice click. Looks yummy and easy recipe. a frequently made curry in my house..had posted sometimes back..clicks are tempting..
Great with rotis/ jeera rice. Yumm..
one of our all time favorite. looks so yummy..feel to have it now. Wow!!! so perfect and yummy!! A very nice picture Aruna. 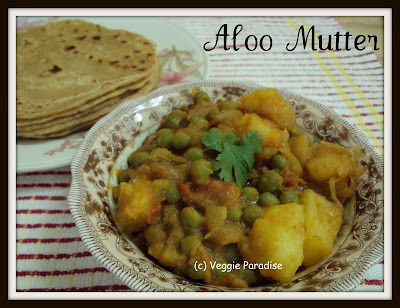 Aloo mutter looks delicious . Gravy looks so shiny and delicious. Delicious side dish for rotis. love your pics..
my all time fav, I always make it little gravier. Yours looks perfect with chapathi. Hi! Please visit my blog and collect your award. Well suited for chappathis, comforting dish at the end of the day. One of my fav side dish. Looks perfect for roit's. 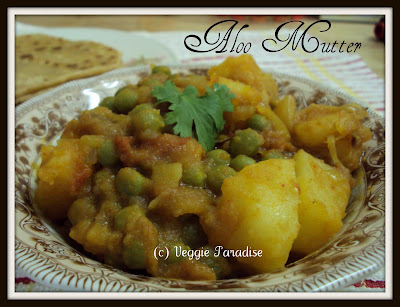 Amma used to make Aloo Mattar with fresh peas. Your pic makes me crave for it. Delicious one, looks tempting nad yummy.